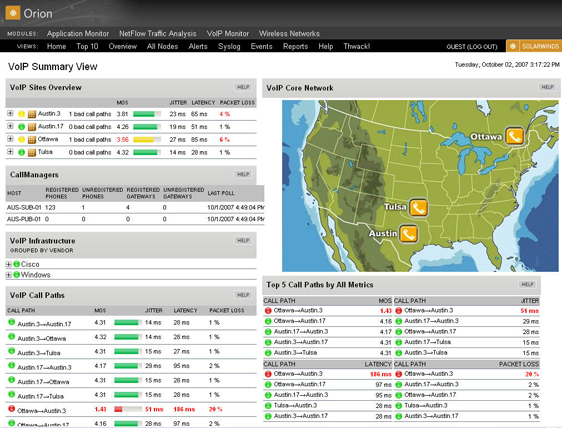 VoIP Monitor enables you to measure and track performance of voice quality across WAN links. Leveraging Cisco? IP SLAs, VoIP Monitor collects and analyzes VoIP performance statistics including MOS, jitter, network latency, packet loss and other important quality of service (QoS) metrics. These features enable you to proactively find the root cause of VoIP performance degradation and measure expected voice quality in advance of a VoIP deployment. ...... These features enable you to proactively find the root cause of VoIP performance degradation and measure expected voice quality in advance of a VoIP deployment. easy-to-deploy and user-friendly interface that offers the familiarity of Orion. Qweas is providing links to Orion VoIP Monitor 1.0 as a courtesy, and makes no representations regarding Orion VoIP Monitor or any other applications or any information related thereto. Any questions, complaints or claims regarding this application Orion VoIP Monitor 1.0 must be directed to the appropriate software vendor. You may click the publisher link of Orion VoIP Monitor on the top of this page to get more details about the vendor.